In this episode I discuss the difference between people-pleasing & peace-making, how to identify if you are a people-pleaser, why it's dangerous, and how to stop people-pleasing for good. Do you find yourself overthinking and overanalyzing every situation? Or perhaps it's something someone said? Do you find yourself getting more and more worked up the more you overthink? In this episode I discuss why we overthink, why it's bad for our mental health, and how to stop overthinking and overanalyzing once and for all. We have all had to face failure and disappointment in our lives. These negative experiences can really drain us emotionally and mentally, and if not dealt with correctly can create toxic structures in our brains. In this episode I discuss 5 steps to correctly dealing with disappointment and failure in order to move on and protect our mental health, and how to turn every failure into an opportunity to improve and grow. We have all experienced the Monday blues and Sunday scares. Some of you may experience it so intensely it may leave you feeling sick with anxiety. So how do we deal with the dread of Mondays and better prepare for the week ahead? In this episode I discuss some mental self-care techniques to help you prepare mentally for a busy week ahead and tips to help you avoid burnout. This is the sixth episode in my Think Learn Succeed series. Why do we forget names? Why is learning important? In this episode I discuss the main reasons we forget things, how to improve memory and learn even if you don't like the subject, and why learning correctly is one of the most beneficial things we can do to improve our mental health. This is the fifth episode in my Think Learn Succeed series. Mindfulness is a very hot topic now. And there are many benefits to being mindful through prayer or meditation. However, research has shown that mindfulness is not enough to help create sustainable healthy mental habits. We need to go beyond mindfulness. In this episode I discuss the benefits of mindfulness, and how to go beyond this first step. I also discuss the correct way to use mindfulness and the other 4 steps to deal with a crisis in the heat of the moment. This is the fourth episode in my Think Learn Succeed Podcast Series. We have all felt shame and guilt in our lives, and sometimes it feels like it never ends. We feel guilty for feeling guilty, and we feel ashamed to feel shame... We cannot seem to escape the shame spiral. Sound familiar? If you are struggling with shame, guilt, or condemnation then this episode is for you. In this episode I discuss why we feel shame, what it does in our brains and bodies, and how to get out of the shame spiral for good. This is the third episode in my Think Learn Succeed Book Club Podcast Series. Why do we remember bad haircuts more than good ones? Why does it feel so much easier to think negatively than positively? In this episode I discuss why we remember the negative more than the positive, how this impacts our brains reward system, an dhow this develops in toxic habits. I also give 5 tips on how to stop negative thinking habits, and cultivate positive mindsets. This is the first episode in my THINK LEARN SUCCEED book club podcast series. In this episode I discuss how to use the concepts in the Perfect You to help young children and/or teenagers find their identities and understand their unique minds. This is the final episode in my Perfect You series. In this episode I discuss why IQ tests and personality profiles are not good, and can be misleading and often damaging. I also discuss a better alternative. This is the third podcast in my Perfect You series. Starting this January we will be tackling the issue of identity in my PERFECT YOU book club! Mental Health issues are not on the rise- rather it is the mismanagement of mental health that is increasing. In this episode I discuss why the current mental health system is failing to help people, and what we can do about this. I also discuss psychotropic medication, and how fo find healing if you struggle with mental ill-health. This is the second podcast in my Perfect You series. **This is informative and NOT individual medical advice. **For general information on the current state of psychiatry please visit http://www.madinamerica.com. I want to make mental health a priority this year. So what's the first step to improving your mental health? Finding and understanding your unique identity! In this podcast I will discuss why identity is the very first thing we need to focus on in order to improve our mental health, and how to begin discovering your unique identity. 1. You will need to get my book THE PERFECT YOU (on sale now for $12.99- save 35%: https://store.drleaf.com/collections/frontpage/products/the-perfect-you) which is also available on Kindle and Audible. Anxiety is a hot topic at the moment. Everywhere we are seeing stats and headlines telling us there is an anxiety epidemic. I disagree and in this podcast I will discuss how anxiety is NOT a disorder and not on the rise. Rather, anxiety is a signal that we need to learn to listen to, and it can be managed without psychotropic medication. Did you know one of the best things you can do to improve your mental health is to build your brain? In this episode I talk about what building your brain means and how to do it. 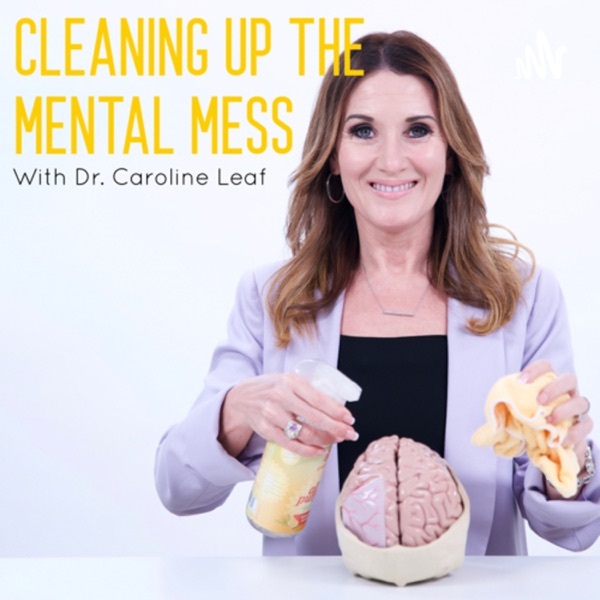 In this episode I discuss intrusive thoughts and OCD- specifically how to manage both and find freedom from a chaotic mind. Positive affirmations are extremely popular but do they actually work? Is there any benefit to saying these affirmations? In this episode I unpack positive affirmations and discuss whether they work or not. We all get angry, and often we are justified in our anger. But when does this anger become toxic? When does it start affecting our mental and physical health? And how do we deal with toxic people? In this episode I discuss how to know when you have stepped over into toxic anger, how to deal with anger, and how to deal with toxic people. Episode #53: The Dangers of "Christianese"
What is "Christianese" and why is it dangerous? In this podcast episode I discuss why we need to avoid throwing around phrases we either don't mean or believe. Episode #52: What is the Mind-Brain Connection? The principle of the mind-brain connection is fundamental to all my work, books, teachings, and talks therefore it's important to understand how it works. In this podcast I break down the difference between the mind and brain, how they work, and why it is important to understand this connection. Episode #50: Is Social Media Making us Depressed? Is technology and social media bad for us and our brains? In this podcast episode I discuss the good and the bad of social media, and how to make technology work for us and not against us. You have probably heard me talk about "freaking out in the love zone," but what does that actually mean and how is it beneficial? In this episode I will show you how learning to "Freak out in the Love Zone" will help you quickly and effectively deal with any chaotic or negative situation in your life without causing more anxiety or toxic stress. I have been getting a lot of questions lately about children and anxiety, specifically how to help children deal with anxiety and depression. So I decided a podcast on this was necessary! In this episode I give 5 tips I have used in my own life with my own children, and used with my patients as well as parents of patients. In this episode I interview Althea Van Wyk who shares her incredible story of how she overcame some of the hardest challenges in life, and how she used her mind to, despite the odds, become a successful businesswoman and leader. A mindset is an attitude, or a cluster of thoughts with attached information and emotions that generate a particular perception. They shape how you see and interact with the world. They can catapult you forward, allowing you to achieve dreams, or put you in reverse drive if you are not careful. In this episode I continue the discussion on mindsets for success, focusing on the Healthy Stress, Expectancy, Willpower, and Spiritual Mindsets. A mindset is an attitude, or a cluster of thoughts with attached information and emotions that generate a particular perception. They shape how you see and interact with the world. They can catapult you forward, allowing you to achieve dreams, or put you in reverse drive if you are not careful. In this episode I continue the discussion on mindsets for success, focusing on the Community and Support Mindsets. See failures as opportunities to gain more knowledge. In this episode I discuss the Time, Possible, and Gratitude Mindsets. In this episode I continue the discussion on mindsets for success from my new book THINK LEARN SUCCEED, specifically focusing on the controlled emotions, forgiveness, and happiness mindsets. An unregulated thought life can hold you back from achieving your goals. In this episode I continue the discussion on mindsets for success from my new book THINK LEARN SUCCEED, specifically focusing on the controlled thinking mindset and the words mindset. Over the next few weeks I will be walking you through the 15 mindsets I identified in my new book THINK LEARN SUCCEED that succeessful people have, and how to cultivate these mindsets, beginning with the THINKER MINDSET. In this episode I interview Dr. Lillian Robertson on stress, the impact of toxic stress on women's health, and how to deal with stress and identity issues as women. What are psychotropic medications and why are they dangerous? In this episode I interview Dr. Peter Breggin, a Harvard trained psychiatrist, on psychotropic medications (anti-depressants, etc. ), safe durg withdrawl, and alternative solutions. More and more people are choosing to take their own lives. More and more people see death as the solution to the difficulties they face. Kate Spade and Anthony Bourdain are high-profile suicide cases that devastated the world. Yet every 40 seconds someone commits suicide—every 40 seconds someone’s world is devastated. So what can we do? How can we help? How can you find healing? For more information on this topic, check out my blog post on suicide. Next week I will be going more in depth on psychotropic medication (anti-depressants, etc.)! This is an extensive topic that serves it's own episode. Episode #34: PCOS- What is it and how do we treat it? Episode #30: 6 More Tips to THINK better, EAT better, and LIVE better! In this episode I discuss everything from postpartum depression to infertility and more with Dr. Lillian Lockett Robertson OB/GYN. Be sure to subscribe to be notified when new episodes are available! Episode #26: Supplements, GMOs, and more! Crazy schedules and too much television lead to one thing: unhealthy lifestyle choices. In this episode I discuss the affects of crazy schedules and television on our minds and bodies, and how to get back to making healthy lifestyle choices. Episode #23: Is modern day marketing hurting our health? Episode #20: Sugar, Sugar, Everywhere! Constantly feel tired, worn out, and unable to achieve your goals? Then you need to listen to this podcast! In this episode I interview Dr. Jason Littleton, America's Energy doctor, on how to gain more energy, and build better and healthier habits. There is not just one solution to the increase in mass shootings becuase there is not just one problem. In this podcast I present the problems and give solutions based on my years of experience in the mental health field. In this episode I continue the discussion on ADD and ADHD. What are these labels? How do we overcome them? Be sure to listen to Part 1 and 2 before listening to this episode. As a child, Dr. Avery Jackson was labeled ADHD. His mother did not accept the label and he went on to become one of the top neurosurgeons in the U.S. In this episode we discuss his incredible story, and how he overcame the ADHD label without medication. Throughout my 30 years in the fields of education and science I have worked with many people misdiagnosed with ADD and ADHD. In this podcast, I begin the discussion on ADD and ADHD. Is this label even scientific? How do we help children with this label? In this episode I discuss hormones, the thyroid, and the mind-body connection with Dr. Irinel Stanciu, one of the leading endocrinologists in the U.S.
Part 2 of my series on social media and the mind. In this episode I continue the discussion on the effects of social media on the mind and how to use social media to our benefit. In this episode I discuss the effects of social media on the mind and how to use social media and technology to benefit rather than harm our minds. In this episode I continue the discussion on Traumatic Brain Injury and discuss potential solutions to aid healing and recovery based on my years of experience in clinical practice. In this episode I interview Dr. Avery Jackson on traumatic brain injury and discuss potential solutions for recovery. In this podcast I interview Dr. Lillian Robertson and Dr. Irinel Stanciu on all things related to menopause and the mind. Ladies, this one's for you! In this episode Dr. Leaf talks about her podcast and what the listeners can expect in future episodes. She also talks about the importance of mindfulness and taking care of your mind.